Hey Bloggers. We hope you all are fine. We are once again with another blogger widget. 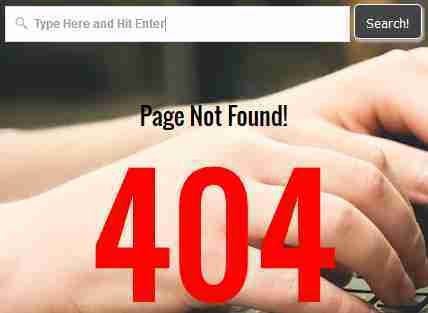 Yes, Today we are here for guide you “How To Create 404 Error Page in Blogger?” In one of our previous post we have shared a article on creating custom 404 error page in blogger and this is,second version of that post. Actually, “404 Error Page” is a page which appear when visitor clicks on a broken link (Incorrect URL) and says to the visitor the page you clicked no more exits or is deleted. By default blogger user can only add plain text along with HTML tags inside the “Custom Page Not Found” input box using search preferences option page. The message display using this technique looks too ugly and we would therefore need a better technique to design a attractive 404 Message for a Blogger blog. Also Read: Another Stylish Below Post Email Subscribe Box for Blogger. Also Read: BlackReen Free Blogger Theme – A Responsive Blogger Template. Also Read: Viral Grid-Mag Responsive Blogger Template – Free & Professional Version. But, Do you know we can add some extra features on 404 error page of Blogspot blogs using “Custom Page Not Found” which you can find on search preferences option page and also we can add some extra features to 404 error page using error_page conditional tag inside blogger template code area. We are going to share second technique because this technique is more powerful than first one. We hope these above features are those features which now a days every one (including me) want on their 404 error pages. So without wasting more time, lets get back to the tutorial to learn that how we can create custom 404 page for blogger. STEP1] Go To Blogger.com >> Click On Template >> Backup Your Template >> Click On Edit HTML. STEP2] Using CTRL+F (Windows) or CMD+F (Mac) and search for </head> tag and paste below whole code just above of the </head> tag. STEP3] Now, Change contacting link with your blog contacting link. STEP4] Now, Click on save template. That’s it. Also Read: How To Add Stylish Email Subscription To Each Post’s Footer in Blogger? Also Read: Add Jumbo Social Sharing Counter Widget to Blogger. Also Read: Stylish Contact Form for Blogger Static Pages. So above guide is about “How To Create 404 Error Page in Blogger?” We hope by this complete guide everyone can easily implement the new stylish error page to their blogger blogs. If anyhow problem persist after following all steps then drop a comment below using comment box. Do Share and Subscribe. 7 Best Customized Blogger Scrollbar CSS Styles – Here’s How To?